Some of our most beautiful native plants do not belong in our gardens. When you see them for sale in a nursery, they are more often than not dug from the wild. 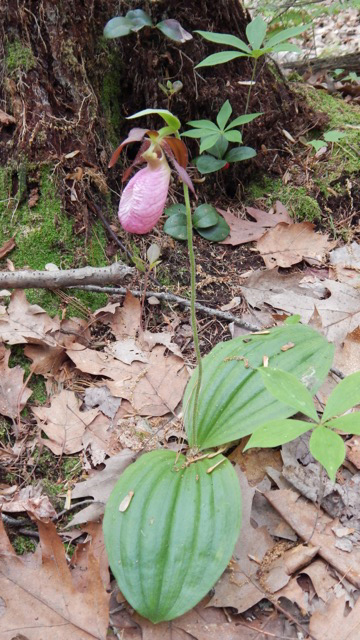 The most common species collected in the wild are ferns, slow-growing woodland wildflowers such as trillium, bloodroot, hepatica, Dutchman’s breeches, trout lily, lady slipper orchids, and sods of bunchberry and lowbush blueberry. The pink lady slipper orchid is a good example of a wild creature that does not want to be tamed. Blooming in late spring, this acid-woodlands plant looks like no other, and a large patch in bloom is spectacular. It is easily recognized by its pink pouch-shaped flower on a single 12-inch stem with two bright-green pleated leaves at its base. The flowers are a challenge to pollinate and it is the native bumblebees that are up for the task of climbing through the narrow opening down to the base of the pouch where they hope to find nectar. There is no nectar, just pollen, so after visiting a few flowers, the bees learn it is not worth the effort and hence many flowers do not get pollinated and produce seeds. If, however, a flower is successfully pollinated, it will produce thousands of tiny seeds. These seeds, like the plant, depend on wild soil fungi to germinate and grow. These conditions are very difficult to replicate in cultivation, so no one commercially propagates pink lady slipper orchids. If you see one for sale, it has certainly been dug up, and transplanting it is unlikely to be successful. Enjoy it in the wild, advocate for its protection, but do not covet it for your garden! Other woodland species, such as ferns, trilliums, bloodroot and other spring ephemerals, can be propagated in a nursery. I have grown many woodland species from seeds and spores, but it is often a slow process. 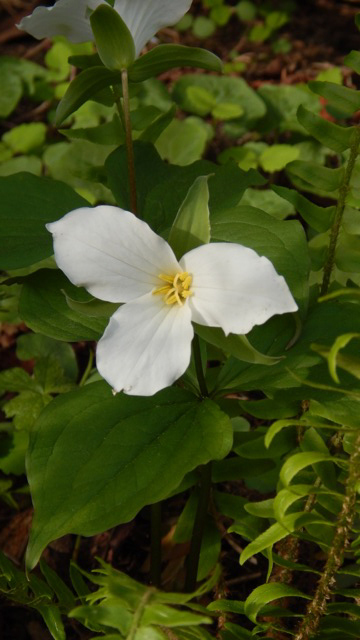 Trillium, for example, is not difficult to propagate, but it is time consuming, and it requires an understanding of the seeds and the forest understory that is its natural home. I will explain how to grow trillium from seed, and then you will understand why a nursery that propagates this plant cannot sell it for a mere $5.00. Maine has four species of trillium that all bloom in spring. They are beautiful and dramatic, with three-petaled flowers atop three whorled leaves. The blossoms may be white, pale yellow, bicolored white with red, or maroon. Six to eight weeks after the plant blooms, the seedpod ripens by suddenly softening and falling off the plant. Ants immediately carry the seeds back to their nest, eat the nutritious, fleshy white protrusion attached to the shiny, dark-brown seeds, and discard the seeds. If conditions are good (trillium likes a humus-y woodland soil with adequate moisture and shade), the seed will lie dormant and germinate after the second spring (yes, nearly two years later). At age 7, it may have its first bloom. A mature trillium plant with multiple blooming stems can be decades old. So if you see a trillium plant for sale in a nursery with pricing similar to other perennials, you can be pretty sure it was not nursery-propagated. Ask the nursery – if they cannot tell you how it was propagated, assume it was dug up in the wild. Let them know that this is unacceptable. If you purchase plants that were collected in the wild, you are undermining the few nurseries that are taking the time to propagate these slower-growing plants. Sadly, in Maine there are no laws about collecting native plants on private land and selling them for profit (other parts of the country have stricter regulations against poaching and require a permit if they do allow any wild harvesting). The only species that are protected in Maine are those listed as rare or endangered; (you can see a list of Maine’s rare and endangered plants on the maine.gov website). Many of the first native plant conservation organizations, such as the New England Wildflower Society, based in Massachusetts, formed over a hundred years ago because wild plant populations were being decimated by unscrupulous plant collectors. Needless to say, shrinking wild lands and a growing human population are making the situation even worse today. In addition, deer relish trillium and other woodland wildflowers, so they are being assaulted on all fronts. So admire the natives who truly deserve their place in the wild. If you are interested in growing some of the more slow-growing woodland wildflowers like trillium, learn to propagate them yourself, so that you are helping to increase, rather than decrease, their numbers. Not all wild things want to be tamed.